Just a quick post to let you know that the US Kindle ebook edition of Where We Belong just began a price promotion this morning. It's on sale for only $0.99, and that price will be good until the end of July. Please tell your friends who like to read (and who don't like to pay a fortune for books). So often I have to leave my poor UK readers out of the price promotions. Now here's one just for you. 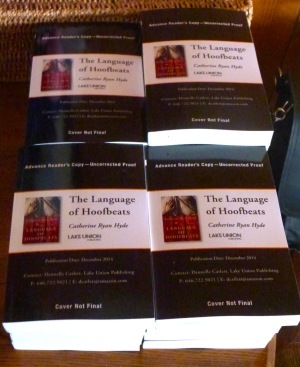 The Language of Hoofbeats is on a special summer sale at Amazon.uk. The Kindle ebook is only 0.99p (sorry, don't know how to do the GB Pound sign on my keyboard) and that price is in place through the 31st of August! If you're in the UK, please help me spread the word. Hey readers, how about a sneak peek at what's next? I still don't have a cover to show you for my next release, Ask Him Why. Soon. I will soon. But the book description just went up on its Amazon page. So take a look and tell me what you think. The book is already available for preorder HERE. Okay, so I've always offered hand-signed bookmarks. They just didn't look as good as this. This is my brand new bookmark, designed just for me and my readers by Laron Glover of Ninth Moon. They are beautiful and shiny and glossy-coated on the front, uncoated on the back for signing and personalizing. As always, they are absolutely free. As always, for book groups: If your group is going to be reading and discussing one of my books, I'm happy to send one for each member, and the postage is always on me. Just go to the contact page, tell me how many people are in your group and send one address for a group representative. I'll send enough for each of you. It's my way of saying thanks for choosing my book. And check out my Swag page (it's under "Extras") if you haven't seen the hand-signed custom bookplates yet. As always, working to bring swaggier swag to my faithful readers. Don't be shy about taking me up on it! For those of you unfamiliar with the concept of The Bet, it goes a little something like this. Well, actually, it goes a lot like this. Several years ago, Author Brian Farrey read an article somewhere about Steven King making a bet that involved, rather than money, the writing of a short story. The "winner" got to dictate the title to the "loser." (Now I ask you, how can you be a winner if you don't get to write a story and a loser if you do?) He proposed the idea on Twitter to see if any authors were crazy enough to take him up on it. Fortunately for Brian, authors are nothing if not a crazy bunch. The call was answered by authors Andrew Smith, Kimberly Pauley, and yours truly. As of this upcoming Kentucky Derby, we've answered it five times. Five. Times. For the purpose of the bet, there might as well be only those four horses running. The winner doesn't need to come in first in the race.He just needs to beat the other players' horses. The person whose horse does best hands a story title (usually torturous) to the person whose horse comes in next, and so on. Winner does not write a story. Big loser does not get to torture anybody with a title. This year I have Mubtaahij. Brian has Carpe Diem. Kimberly has Rock Shandy. Andrew has Keen Ice. If it seems like I've told you too soon, and now you're just waiting too long for stories, you can read my three stories from years past while you're waiting. Last year I chose the winning California Chrome, and so did not write a story. The story links are: The Art of Being Stuck Here, Uncle Mo Hold a Grudge, and Even Pigeons Can Sing. Wish me luck. Then again, the stories are fun to write, so it hard to say what luck would look like in a case like this. I'm very happy to report, all in one place and at one time, what I've announced in bits and pieces over the last month or two. Audible audio approached us several months back about acquiring four of my independent (in the US) titles and adapting them into unabridged audiobooks. They are: Where We Belong, Don't Let Me Go, Second Hand Heart and When You Were Older. I'm please to say they are now all available for purchase/download. Note the titles above are links to each audiobook. But now here's what I'm even more pleased to say: Audible was kind enough to send ten promotional codes for each title. Each code is good for one free download. I'm only keeping one of each, and I've already given one more of each away to a sight-impaired reader. That leaves eight free downloads of four audiobooks, for a grand total of 32 free audiobooks. So a hundred people could enter this giveaway and each still have a one in three chance of winning. If you have trouble, email me and let me know (my address is on the Contact page) but it seems commenting is fixed for most of you. I'll collect entries until about the end of the month and then choose names at random. Good luck! I'm thrilled to report that another of my titles is now available for preorder in an unabridged audio edition. Audible recently purchased four of my backlist titles and is producing and releasing their audiobooks one after the other. This time it's When You Were Older. It releases on February 10th (soon!) but can be preordered right now. Just go to THIS LINK. Two more announcements to follow shortly. Usually I say "Happy reading!" In this case I should probably say "Happy listening!" Or "Happy commute!" Because nothing makes a commute better than a good audiobook. Laron Glover of Ninth Moon has designed and created these three lovely custom bookplates. They can be personalized and signed, and they are easy to mail to you. Now all of my books on your shelves can be signed copies! Here's how to get one (or more). It's easy. Be sure to tell me which of the three designs you want and how you'd like it personalized. That's it! It's my way of saying thank you! Audible recently purchased the audio rights to four of my backlist novels, Don't Let Me Go, When You Were Older, Second Hand Heart, and Where we Belong. They are all in various stages of production as unabridged audiobooks. The news today is that Don't Let Me Go is now available for preorder! Just CLICK HERE. Hope you enjoy the new editions! I'm pleased to announce that When I Found You has been chosen as a Kindle Monthly Deal for the third time in its published life. That means that the Kindle ebook edition will be $1.99 for the entire month of January. This was a very significant book in my life. It sold at least as well as Pay It Forward, restarted my career, and helped me connect to my audience of readers (translation: YOU), the people who like to read what I like to write. If you already have a copy, please pass this deal along to reader friends who have not read it. That word of mouth is always much appreciated. Happy New Year, folks! I think it's going to be a great one. The 15th Anniversary Edition of Pay It Forward is here! Today (December 23) is a book birthday of sorts. Today is the day Simon & Schuster releases the 15th Anniversary Edition of the Pay It Forward book, the original adult version. It has a lovely new cover, a new introduction by me, and it's a great celebration of the fact that the book has been in print for fifteen years! The more you know about the publishing business, the more you will appreciate how truly unusual that is. I told my former agents (they are now in a new line of work) years ago that my goal was for Pay It Forward to stay in print longer than I do. Well, I still have a few good decades in me, but so far so good. Pay It Forward fans, please pass it on. Great time to buy copies to give as gifts. Yeah, I know. We just missed Christmas buying. But Pay It Forward is about giving all year round, not just on Christmas. Thanks to all of you who made this book such a success and kept it in print all these years by buying copies. You are appreciated! The Don't Let Me Go scene adaptation is here! It's not a whole movie. It's an adapted scene. The best way I can describe it, I think, is to say it's a very different way of looking at a book trailer. In the past I recorded myself reading excerpts from a book and made a little film or montage of photos for you to watch while you listened. But this really takes it a step further. It's an actual live-action production of the excerpt! Okay, enough talking about it. Here it is. And of course I look forward to hearing what you think! Check out my new photo site! All of you who know me know that amateur photography, especially nature photography, is very important to me. And when I first created this new site, I struggled with how to fit them all in. I could only show about five of each gallery without bogging everything down and causing slow loading. I don't want to complicate this site too much, but I don't want the photos to be an afterthought, either. I still have a page on the navigation bar above for my photos, but its purpose now is to link you to the new site. I think you'll find it easy to navigate. I'll keep adding to it, of course, and the most recent galleries will be right up front, so you can always see what's new. Take a look around. Let me know what you think. Then I got all wrapped up in the new Take Me With You release and its incredible numbers (like #3 and #4 in Kindle). And it's a bit of a distraction. But July isn't over yet. So let's go ahead and do this right now. I'll collect entries for three days or so and then choose a winner at random on the first of August. If you don't win, don't despair. Read my post about the new "No Losers" seven entry rule. Leave a comment below to be entered. Please DO leave your email address in the comment form. I promise I won't use it for any other purpose but to notify you if you win. Please DON'T leave your email address in the body of your comment unless you want everybody to see it. And remember the "author" in the comment form is the author of the comment, not the book. In other words, you. In each of these giveaways one or more people comment as "Catherine Ryan Hyde" because they see "author" and think it means me. Please use your own name, otherwise I can't enter you, because I'll have no idea who you are! The winner of this coffee table book for July is Tarah. But if you didn't win, don't despair. I'll give away another in August. Plus there's the new seven-entry "No Losers" rule. Read about it here if you're not familiar. I've been doing giveaways on my blog for years. Pretty regularly. Right now I'm giving away six of the ten Take Me With You audiobooks the publisher sent me. I enjoy it. I don't mind the postage costs (it's a tax-deductible promotional expense, after all). And I know avid readers struggle with book budgets. And I like rewarding the readers who are so faithful to me and my books. There's just one thing I don't like about it. Every time I pick winners, a few of my wonderful fans who did not win leave comments, here or on Facebook, that quietly say something like, "Congratulations to the winners." You can hear the sigh. Some are more directly honest and say, "I never win." Or just sigh. I don't want readers signing up for giveaways over and over and over and coming away feeling like they never win. That it's always somebody else's name coming out of the hat. So I've come up with an idea. I sat on it a while. And the more I sit with it, the more I like it. If you enter seven giveaways and don't win a book, just point out to me the seven you entered. And I'll send you a book. For the dedication of that continued effort. For being someone who's so closely involved with my blog and my books. You can even pick which book you want me to send. Just don't pick an audiobook, please, because I don't keep extras of those lying around the house. This can be retroactive, too. Think you've already entered seven giveaways? Look back and see which ones they were and then email me. Count them up and only get five or six? Well, I have a giveaway going on now and at least one more for the month of July. Won't take you long to get there. No more sighs. More reading, less sighing. As some of you may know, I was just away on vacation. While I was gone, quite a few fun things turned up on my doorstep. First of all, I got my author copies of the brand new Take Me With You, due out from Lake Union/Amazon Publishing on July 22nd. In the box were both MP3 and CD audiobooks. Five of each. And as you know if you follow this blog, I archive two of each. Send me five and I give three away. 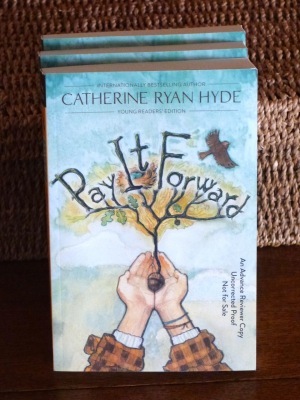 I also got advance readers' copies of the new Young Readers' Edition of Pay It Forward, due out August 19th. So that will be the next giveaway. And of course I have to give away another 365 Days of Gratitude photo "coffee table" book in July. I thought about doing it all at once, but it made me tired to think about it. Too many ways that could get complicated. So I'm going to start with these six audiobooks. All you need to do is leave a comment to be entered. Please DO leave your email address in the comment form. I promise I won't use it for any other purpose but to notify you if you win. Please DON'T leave your email address in the body of your comment unless you want everybody to see it. And remember the "author" in the comment form is the author of the comment, not the book. In other words, you. In each of these giveaways one or more people comment as "Catherine Ryan Hyde" because they see "author" and think it means me. Please use your own name, otherwise I can't enter you, because I have no idea who you are! And if you have a preference between CD and MP3, please state it clearly in your comment. I'll run this giveaway for about a week and then move on to the next. Good luck! This giveaway is officially closed. The winners are Mimi, Viv C., Laura Ruthemeyer, Roxana, Pat Wieczorek, and Carole Lewis. If you didn't win, check out my blog post "No Losers." And start counting! Most of you know I have another brand-new novel releasing in December. Yesterday, just a week or two after receiving the advance reader's copies of Take Me With You, my July release, the UPS guy brought me these. Now. There's just one catch. I'm going off on a two-week trip in the new camper van (photos to follow). So I won't be around for this giveaway. Which doesn't really matter when you think about it. It just means I won't answer your comments with my own. You just have to trust that when I get home in the first week of July, I'll have them all in one place and draw names. After the 4th of July holiday, I'll draw four names. I came back to this blog post this morning to see how many of these I promised to give away. Much to my surprise, it seems I didn't state a number. So I choose five. Will draw names shortly after giving people one last chance to enter. Ooops. I didn't read down far enough. I said I'd give away four. But now I'm giving away five, aren't I? Aaaaand... the winners are... Misty Miller, Tory Young, Cindy H., Carole Bishop, Estelle. If you didn't win, have no fear. This is going to be a very big month for giveaways. I have a lot of stuff I'm about to post, including six audiobooks of Take Me With You and arcs of the new Pay It Forward Young Readers' Edition! And of course another 365 photo book for July. You'll always have more chances!